Take a look at this brilliantly red, 100% cotton women's tee! 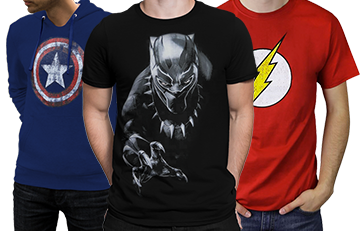 It features the iconic Wonder Woman symbol but in distressed fashion. This tee is available in the super popular slim fit women's tee that hugs your curves in all the right places as well as the standard classic cut for a more relaxed look. Specific sizing on this item can be found in the more photos section! Wonder Woman, Amazonian Princess, has incredible powers that include super human strength, speed, and agility! This warrior princess holds her own and then some when she's battling the bad guys with the Justice League. Did we mention she also has an invisible jet, the lasso of truth and the bracelets of submission? To put it lightly, she is a kick-a$$ superhero! 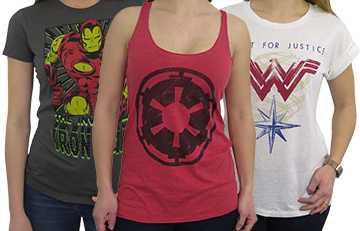 Embrace the superhero in you with this Wonder Woman Women's Distressed Symbol T-Shirt! The T- shirt ft great. I wore as part of a costume for awesomecon. Got lots of compliments. Got this for my girlfriend. She loves it to death. It fits and looks great on her. She told me it feels great also. Lindy, Wonder Mum to two little Superheros! This is my new favorite shirt! I've been informed by my little Superhero's, that it makes me by far the best mum at school and at sports lessons! Great shirt which will be a part of my Halloween costume for school. Can't wait to wear it and rock out as this classic superhero! Looking forward to wearing it after Halloween as well. I liked the quality and the print! Fits great, not too boxy, nice material and great color. Great purchase! I was excited to get my first Wonder Woman t-shirt and it arrived a day ahead of the tracking schedule but after I tried it on the Wonder Woman logo sat too high on the front. After I washed the t-shirt for the first time the cotton became wrinkly and needed to be ironed. Bought this shirt for my girlfriend and she is pleased with it. Bought a slim medium and it fit perfectly on her! 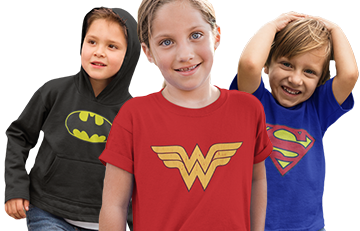 The shirt I ordered was a Wonder Woman logo. Great fit with the perfect shade of red. I am so pleased with the time it took to get to me. Great fit, high quality and vivid colours! The fabric was comfortable. Easy to wear and easy to clean. I washed in the washer but I always hang my T-shirts up to air dry. I ordered this t-shirt for my girlfriend as a surprise gift...and she absolutely loves it! It fits quite well on her, not restricting any movement at all despite the shirt's "fitted" design around the waist. The emblem itself is well designed, with just enough of a faded "touch" to give a unique look for those wearing it. I would definitely recommend this t-shirt to others! This shirt fits perfectly and looks awesome!! I wore it for a relay race. Our team had a superhero theme, and I was all decked out as Wonder Woman. I got so many compliments! :) The shirt is great quality material and very bright color. Love it!! Very sorry you weren’t happy with your purchase. We do our best to list size charts with most of our items and offer a hassle free return and exchange policy if the item you receive does not meet your expectations. Please contact our customer service department and they will be happy to work with you on this. Product purchased for teenage girl. The product was exactly as described. Pleased with quality as well. This was not my only purchase and will definitely shop here again. Great looking shirt & one I had not seen in stores.